Summary: On this Labor Day let’s revisit the lost history of the union movement, and its vital contribution to building the middle class. To remember the loneliness, the fear and the insecurity of men who once had to walk alone in huge factories, beside huge machines. 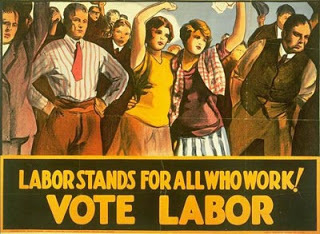 To realize that labor unions have meant new dignity and pride to millions of our countrymen. To be able to see what larger pay checks mean, not to a man as an employee, but as a husband and as a father. To know these things is to understand what American labor means. Since 1990 wages are falling as a share of Gross Domestic Income (GDI); profits are rising. The reasons are complex, the result has by now become unmistakable: a shift of our national income from return on labor to return on capital. Since the nation’s wealth is so highly concentrated, the result is rising inequality of income. 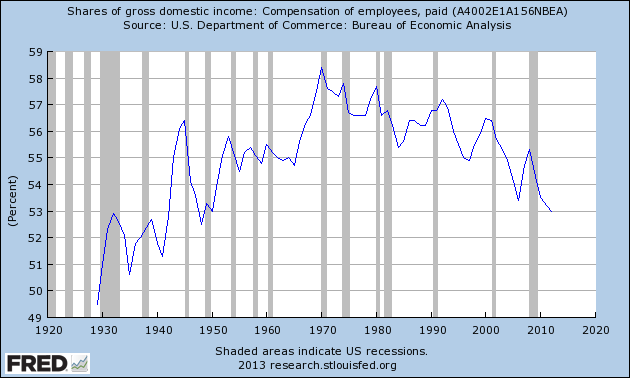 Wages as a share of Gross Domestic Income: down and falling. 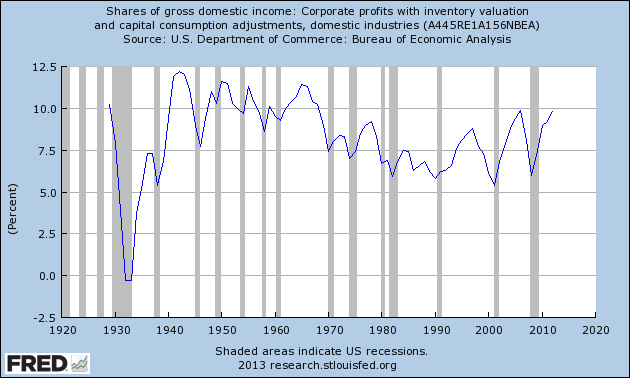 Profits as a share of Gross Domestic Income: up. The middle class was not a gift of the Blue Fairy. Instead of “Bibbidi-Bobbidi-Boo” there was 150 years of worker working together, mobilizing against their employers — who organized cartels to fight their employees and raise prices for their customers. 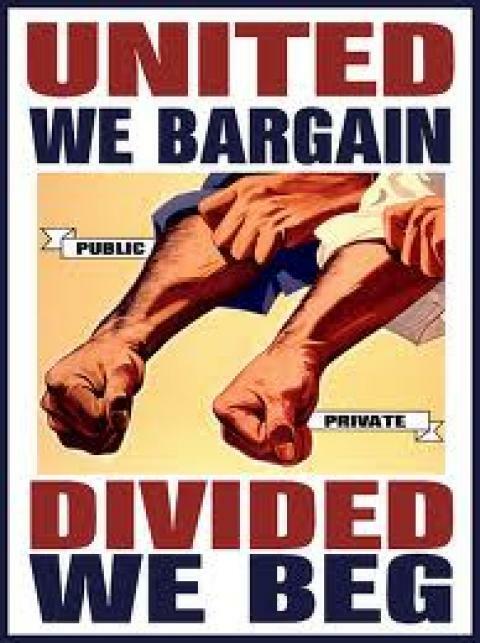 It was a long bloody struggle, The victory of unions was foundational for the growth of America’s middle class. The fall of the unions was a major factor undermining the middle class. It had many causes: corruption, greed, stupidity, infiltration by organized crime — and the long successful counter-revolution by corporations, now eroding away the middle class. For a blow-by-blow of unions rise see this series by Erik Loomis (Asst Prof of History, U RI). The toll these people paid is as much a cost of building America as much as that paid by our the members of our armed forces. June 7, 1913: Paterson Silk Pageant. Addendum here.